Main Idea: We are invited to be agents of hospitality by stepping out in faith. As soon as word spread about Jesus—his teachings, healings, and miracles—it was nearly impossible for him to find a quiet moment away. The people were hungry for hope, and Jesus brought hope in abundance. a stone soup story, where the need of the crowd is met due to the ever growing generosity of crowd members sharing what they have brought. Either way, this story tells us of the generous nature of Jesus who modeled hospitality everywhere he went. 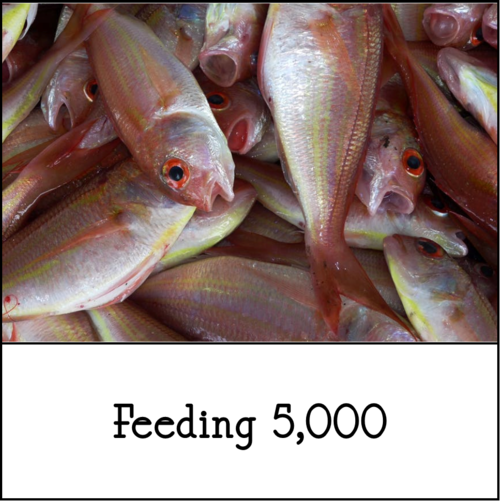 Whether the food multiplies, or the generosity of the crowd multiplies, it is a miracle. The call to the disciples was to be the agents of hospitality. To step out in faith and deliver. Whether feeding the masses or stepping out of a boat in a storm, Jesus’ invitation was for action. He would not be with them for long. They needed to learn to be the change. I remember growing up hearing my dad tell of his childhood just following the Great Depression. Whenever people showed up at the door for a visit, grandma would feed them, often when there wasn’t even enough to feed her own family. She would whisper, “FHB” meaning “family hold back,” so that the guests would leave satisfied. stone soup? The miracle was the profound change made possible by the sharing of food. Psalm 95:1-5, A Joyful Noise!